Select options for Cat-X, Fiber or a combination or both. Combine DVI, HDMI, USB, Audio and RS-232 switching in the same frame. Flex-port technology for auto-sensing and mapping of attached extender devices. Build systems with single, dual or quad-display in the same frame. High performance backbone supports resolutions up to 2560 x 1600. Building on the field proven technology found in the Draco tera enterprise, the tera compact series brings a full set of high performance features at an affordable price. It is a simple operation to set up and configure the matrix with the on-screen display (OSD) or through any of the available software bundles supporting the feature-enhanced Draco tera tool. For those who prefer a third party control application, the Draco tera compact can be configured to operate with many popular control systems using the IHSE API protocol package. Outboard extenders can be connected with Cat X up to 140 m on either side. 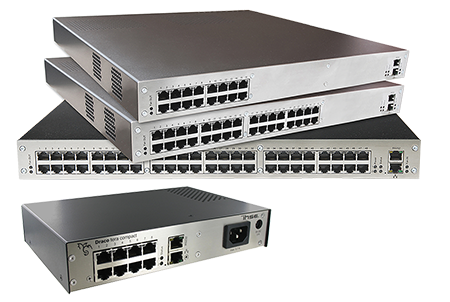 With the 64 port (48/16 fiber) and 80 port (48/32 fiber), KVM signals can be extended up to 10 km. Extenders can accommodate a variety of signal formats and the Draco tera compact auto-senses the individual units through any available port on the chassis. By simply connecting the extender to the chassis, the internal control software will recognize and auto configure the port as a CPU or console device.